Great mid sized SUV, the good definitely outweighs the bad. I like our pilot. While this is the only midsize SUV I have ever owned I would definitely look into getting another pilot when this one doesn't run anymore. At almost 15 years old and nearly 200000 miles we have only ever had to put in minimal work. I love having the optional third row/large trunk transition. While we usually have the third row down for more trunk space it's nice to have in case of extra people. However the third row is really small and cannot sit a large kid or adult comfortably and is hard to access, especially with carseats in the middle row. I also wish the heating and cooling system for the middle row was located higher, as the air barely reaches my kids, or not at all in a rear facing car seat. 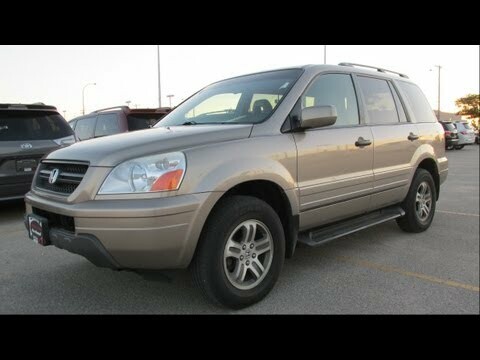 When we get a new care we will definitely look into another Honda Pilot. Versatile SUV that allows you to carry a dishwasher or 8 people. Love this vehicle. I can carry a 10’ board, a large chair, stove, dishwasher or carry 8 people. I am a artist and carry flower arrangements, my pottery set up and pottery all in my Pilot. Maintainability is easy and it drives on and on. Hardly have had any problems at all. I have got almost 200, 000 miles on it and still starts up easily. The leather heated seat has gone bad on the driver side has quit but it still works on the passenger side. We have replaced the breaks three times in 15 years, but we bought it used. I cannot think of anything about this vehicle I do not like. Great car with lots of space for passengers and storage. I love my Honda pilot. They definitely hold their value over the years. The third row is super convenient when we have family and friends riding with us, and it is also so easy to lay the seat down and leaves tons of trunk space. Even with the third row up I am able to fit by double stroller in the trunk and everyone remain comfortable. It is a very smooth ride. Easy to work on. Sleek appearance. Comfortable seats. A luggage rack on the top. I absolutely recommend anyone to consider a Honda pilot. They are fantastic! CERTAIN SPORT UTILITY VEHICLE'S CERTIFICATION LABELS MAY CONTAIN INCORRECT VEHICLE WEIGHT AND TIRE SIZE INFORMATION. OWNERS WILL BE REQUESTED TO INSPECT THE CERTIFICATION LABEL OR TO CONTACT A DEALER TO PERFORM THE INSPECTION FOR THEM. IF THE LABEL IS INCORRECT, OWNERS SHOULD CONTACT THEIR DEALERS TO ARRANGE TO HAVE A CORRECTION STICKER PLACED OVER THE INCORRECT INFORMATION. THIS RECALL BEGAN ON AUGUST 11, 2004. OWNERS SHOULD CONTACT HONDA AT 1-800-999-1009.